Lyndon McLellan has spent more than a decade running L&M Convenience Mart, a gas station, restaurant, and convenience store in rural Fairmont, North Carolina. Then, in 2014, without any warning, agents from the IRS seized his entire bank account, totaling more than $107,000. With that, Lyndon entered the upside down world of civil forfeiture, where the government can seize and keep ordinary Americans’ property without ever charging them with a crime. The IRS and Department of Justice continued to pursue forfeiture of Lyndon’s money despite a recent policy change designed to prevent precisely these kinds of cases. In October 2014, the IRS announced that (absent “exceptional” circumstances) it would pursue forfeiture in cases like Lyndon’s only where there was evidence that the money being seized was derived from illegal activity. The U.S. Department of Justice announced a similar policy change in March 2015. Under these new policies, the government never should have pursued forfeiture of Lyndon’s bank account. But the government refused to back down even after the policy change was announced. Lyndon did nothing wrong. That is why he teamed up with the Institute for Justice to fight this shocking abuse of power, to get his money back and to make sure the government does not do this to anyone else. On June 29, 2015, in the face of widespread public outrage, the government finally returned Lyndon’s money. For over a decade, Lyndon McLellan has manned the register, swept the floors, cooked food, washed dishes and taken care of countless other tasks that go into running his convenience store. He worked hard to put away a little money. Then, in an instant, the IRS seized his entire bank account using a little known legal maneuver called civil forfeiture. They claimed he violated so-called “structuring” laws because he deposited money in the bank in amounts under $10,000. The government is pursuing the forfeiture of Lyndon’s money despite a policy change meant to prevent exactly these kinds of cases. Chastened by public outrage over similar stories, including Institute for Justice clients Carole Hinders and Jeff Hirsch, the government announced in October 2014 that it would only apply the structuring laws to property owners engaged in illegal activity. But Lyndon isn’t a criminal; he is an ordinary, hard-working small business owner. But what the IRS is doing isn’t just wrong, it’s also illegal. Together with the Institute for Justice, Lyndon is fighting to get his money back. This legal challenge will not only vindicate Lyndon’s rights, but the right of all Americans to be free from arbitrary and unlawful seizure of their private property. In 2001, Lyndon McLellan purchased a small convenience store on the side of the road in Fairmont, North Carolina and named it L&M Convenience Mart. L&M is located in one of the poorest communities in the United States; Fairmont has a median household income of $21,484. When Lyndon bought it, the store was little more than a few gas pumps and a refrigerator. For years, Lyndon worked every day at the store, rarely taking a vacation. Many days, he worked from opening straight through to closing. Thanks to Lyndon’s hard work and diligent savings, he was able to expand the store to include a restaurant, a walk-in beverage cooler and long shelves of other products. You can buy a catfish sandwich for $2.75. The store is almost as much a community center as a business. The same group of customers comes every day for breakfast, sitting and drinking coffee at the counter. Customers know Lyndon by name, and he knows them, too. In July 2014, a group of federal and state law enforcement officers arrived unannounced at Lyndon’s store. They informed Lyndon that his entire bank account—all told, $107,702.66—had been seized by the IRS. When he pleaded that he had outstanding checks to vendors, and that the checks were going to bounce if they emptied out the account, they told him there was nothing they could do and that there was no use getting upset. They were seizing his money regardless of the impact on his business. Lyndon is not alone. Carole Hinders owned Mrs. Lady’s Mexican restaurant in Arnold’s Park, Iowa. The IRS seized and attempted to forfeiture more than $33,000. Thankfully, after IJ stepped in, the IRS relented and gave back Carole’s hard-earned money. The government targeted Lyndon under so-called “structuring” laws, which make it a crime to avoid federal bank reporting requirements by intentionally keeping deposits below the federal reporting limit of $10,000. The structuring laws were intended to target drug dealers, money launderers and other hardened criminals. But, as Lyndon’s case demonstrates, they often sweep up legitimate businesses accused of nothing more than doing business in cash. In Lyndon’s case, a bank teller told his niece (who typically makes the deposits for the business) that depositing less than $10,000 would avoid unnecessary paperwork burdens. Neither Lyndon nor his niece had any interest in hiding from the IRS. The niece just wanted to make life easier for everyone at the bank. What happened to Lyndon was supposed to be a thing of the past. In response to a front-page New York Times article detailing similar cases—including IJ clients Carole Hinders and Jeff Hirsch—the government announced a policy change designed to limit enforcement of the structuring laws to “illegal-source” cases, meaning cases where the money involved in the allegedly structured transactions was derived from illegal activity. The IRS first announced this policy change in October 2014, and the U.S. Department of Justice followed suit in March 2015. The IRS policy change applies to structuring seizures (like Lyndon’s) under the auspices of the IRS; the DOJ policy change expands the scope of that policy to cover all structuring seizures by the federal government. Under these policies, the government should not be pursuing Lyndon’s case. The government has never even suggested that Lyndon’s business is anything other than what it appears to be—a legitimate, lawful convenience store. Lyndon is not a criminal. He is an entrepreneur, working hard every day to grow his business. In short, he is exactly the kind of person these policy changes are supposed to protect. Indeed, after the money was seized, Lyndon’s accountant undertook an audit of the business to trace the source of the sub-$10,000 deposits. By painstakingly matching receipts with deposits, the accountant demonstrated that every penny was derived from Lyndon’s legitimate convenience store business. But when Lyndon and his accountant presented these findings to the government, they were dismissed. Even after the policy changes were announced, the government has continued to take steps to keep Lyndon’s money. The government filed its forfeiture complaint in December 2014, two months after the IRS announced it would not forfeit money in cases like this one. And that complaint remains pending in the court today, despite the DOJ policy change announced in March 2015. The government also continues to pursue Lyndon’s money despite negative attention from members of Congress. In fact, the prosecutor handling the case responded to news of congressional interest with a hostile and threatening email. The government’s conduct in this case has been made possible by civil forfeiture laws, which allow the government to take and keep property it merely suspects of being involved in a crime—no matter how thin the evidence. This is different than criminal forfeiture, in which the proceeds of criminal activity may be seized after someone is convicted of a crime. To get their cash back, property owners must wage a lengthy and expensive legal battle against the U.S. Department of Justice to prove their own innocence. 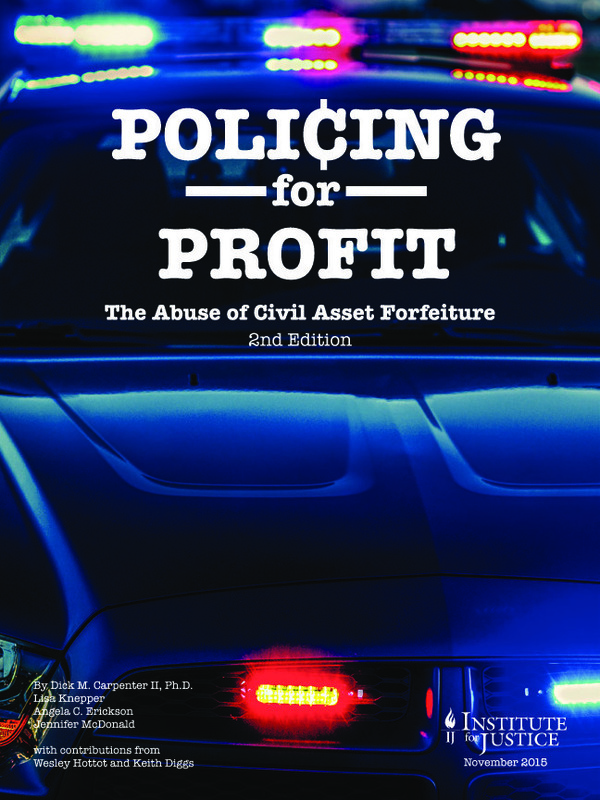 Shockingly, the government uses the money that it seizes through civil forfeiture to pad the budgets of the very agencies that seize the money. In justifying civil forfeiture, the government claims that the law is used to take money from big-time criminal syndicates and drug cartels, but in truth it is also often used to take money from wholly innocent property owners, like Lyndon. In other cases handled by the Institute for Justice, the government seized over $35,000 from the owner of a supermarket in Michigan, over $32,000 from the owner of a small-town restaurant in Iowa and over $446,000 from three brothers who operate a business distributing candy, food and cigarettes to convenience stores on Long Island. According to Seize First, Question Later, a report by the Institute for Justice, the IRS alone seized more than $242.6 million under the structuring laws in more than 2,500 cases between 2005 and 2012. At least a third of those seizures involved no allegations of criminal activity, beyond the mere act of engaging in sub-$10,000 cash transactions. Lyndon’s case is hardly unique, and instead calls attention to a far broader problem with the civil forfeiture laws. What Lyndon did isn’t a crime and shouldn’t be treated as such by the government. The structuring laws were intended to target hardened criminals seeking to keep their crimes hidden from the federal law enforcement officials. For that reason, the structuring laws require that the government prove the property owner kept cash transactions under $10,000 with a specific purpose to evade bank reporting requirements. Lyndon lacked that specific purpose. He will argue that any other interpretation of the statute would violate due process by applying the structuring laws to perfectly innocent business owners who have no reason to believe that it is illegal to make cash deposits in amounts under $10,000. Lyndon also will argue that taking a business’s entire bank account merely because the business owner depositing lawfully-earned income in the bank in the “wrong” amounts violates the prohibition against “Excessive Fines” imposed by the Eighth Amendment to the U.S. Constitution. The prosecutor’s email objecting to publicity about Lyndon’s case is notable, in part, because it sheds light on the ways in which prosecutors can abuse court procedures to conceal their activities from the public. When prosecutors move to seize property, they often file the supporting affidavit “under seal,” meaning the filing is not publicly accessible, let alone accessible to the property owner. Prosecutors justify secrecy on the ground that, if the property owner learned of the impending seizure, they might take the property and flee the jurisdiction. But these filings are often kept under seal long after the property has been seized and the risk of flight has passed. The prosecutor’s email in this case confirms that prosecutors view sealed filings as a way to thwart public scrutiny of their actions. The seizure affidavit in this case was filed under seal, ostensibly to keep Lyndon from learning about it. After the seizure was complete, the prosecutor himself provided Lyndon with a copy—implicitly acknowledging that the need for secrecy had passed. Still, when the prosecutor learned that the affidavit had been provided to Congress, he immediately objected on the ground that the affidavit had been filed under seal. Sealed filings are intended to promote legitimate law enforcement interests, not to allow prosecutors to evade public scrutiny. The email in this case shows how easily such procedures can be abused. The government’s offer to walk away from the case with 50% of Lyndon’s money likewise demonstrates a broader phenomenon: Rather than bring structuring cases before the courts, the government often seeks to resolve such cases by making property owners an offer they cannot refuse. For many property owners targeted under the structuring laws, it simply is not possible to fight the federal government. Businesses may rely on access to seized funds to make payroll, pay vendors and keep on the lights. And fighting a seizure can take months or even years; between 2005 and 2012, the average structuring forfeiture took nearly a year to complete, and the longest case took more than 6.5 years. The cost of litigating such a case can be prohibitive, particularly as half of all seizures during that same period of time were of amounts under $34,000. Many property owners cannot afford a prolonged legal struggle, and so are forced to agree to settlement terms similar to those offered to Lyndon here. While hard statistics on the proportion of cases that settle are not currently available, existing data suggest a great many cases do. In half of its seizures, the IRS ultimately forfeited less money than it seized. And, of the $242 million seized by the IRS between 2005 and 2012, about half ultimately was not forfeited. Available data don’t explain why seized money was not forfeited, but there are only a few possibilities: an IRS loss in court; a prosecutor’s decision not to pursue forfeiture, perhaps for lack of evidence; or a settlement. Notably, in the cases of Carole Hinders and Jeff Hirsch, the government likewise offered to drop the case for a portion of the funds. Lyndon did nothing wrong. That is why he has teamed up with the Institute for Justice to fight this shocking abuse of power, to get his money back and to make sure the government does not do this to anyone else. Unlike many property owners, Lyndon has the benefit of free legal representation from the Institute for Justice, and therefore can afford to fight the seizure of his bank account. Lyndon is fighting to get all of his money back, but he’s also fighting to bring attention to the government and to help other property owners who are targeted by the government and forced into settlements. The government’s civil forfeiture action is titled United States v. $107,702.66 in United States Currency. That strange name is the result of a legal fiction in civil forfeiture actions, in which the government sues your money instead of suing you. As a result, the money is the defendant; the United States is the Plaintiff; and Lyndon appears in the case as a Claimant “defending” his right to his own money and asking for its return. The Institute for Justice attorneys representing Lyndon are Robert Everett Johnson, Wesley Hottot and Scott Bullock, who litigate property rights and economic liberty cases nationwide. Local counsel for the case is James R. Lawrence, III, an associate at Coats & Bennett PLLC in Raleigh, North Carolina. The Institute for Justice is the national law firm for liberty. IJ is a public-interest law firm that advances a rule of law under which individuals can control their destinies as free and responsible members of society. Through litigation, communication, outreach and strategic research, IJ secures protection for individual liberty and extends the benefits of freedom to those whose full enjoyment is denied by the government. IJ is based in Arlington, Va., and has offices in Arizona, Florida, Minnesota, Texas and Washington, as well as a Clinic on Entrepreneurship at the University of Chicago Law School. United States Census, Income in the Past 12 Months, 2009-2013 American Community Survey 5-Year Estimates, at http://factfinder.census.gov/faces/tableservices/jsf/pages/productview.xhtml?src=CF (last visited Apr. 20, 2015). Video of the hearing is available at http://www.ustream.tv/recorded/58691793. The relevant discussion starts at approximately 58:00.